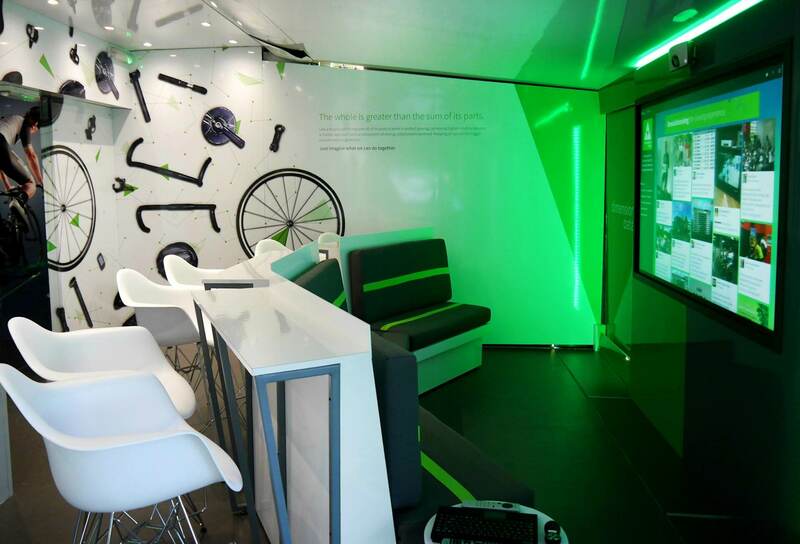 How do you fit the ultimate customer experience…into a single truck? An impressive 135sq metre double gullwing lorry trailer sets the tone. Complete with full wrap artwork and a lifesize Tour de France starting arch, complemented by bicycle chain fencing, bicycle tyre furniture and bicycle frame door handles. 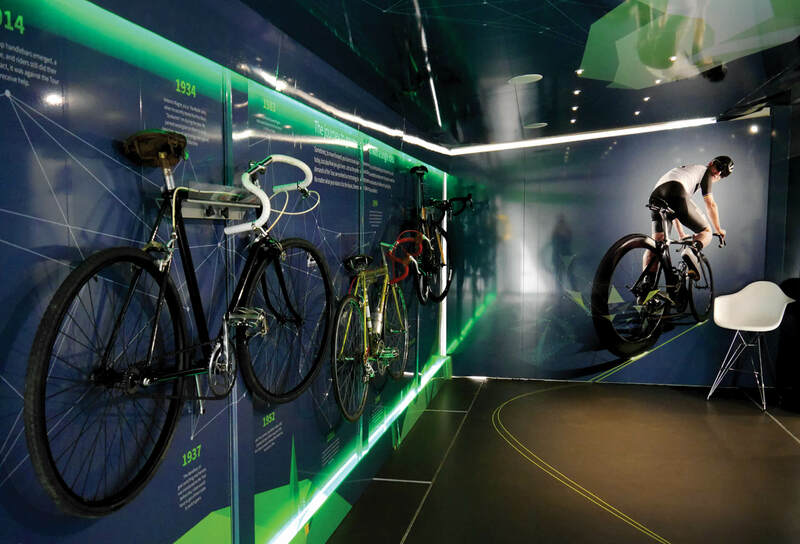 As visitors enter, a huge 180” interactive timeline plays, explaining the history of the Tour de France and how technology has helped impact its development since 1903. 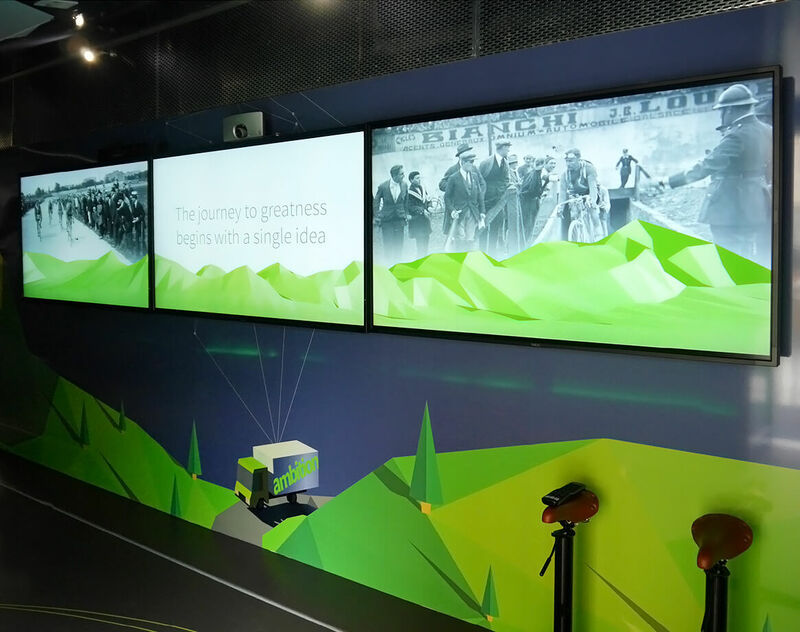 This was complemented by an installation housing 103 years of bicycle advancements, complete with 5 augmented reality triggers bringing the story to life. Bespoke banquette seating immediately welcomes visitors, with an interactive 80” screen for business presentations to take place, matched with a more private area for conversations in zone 3. 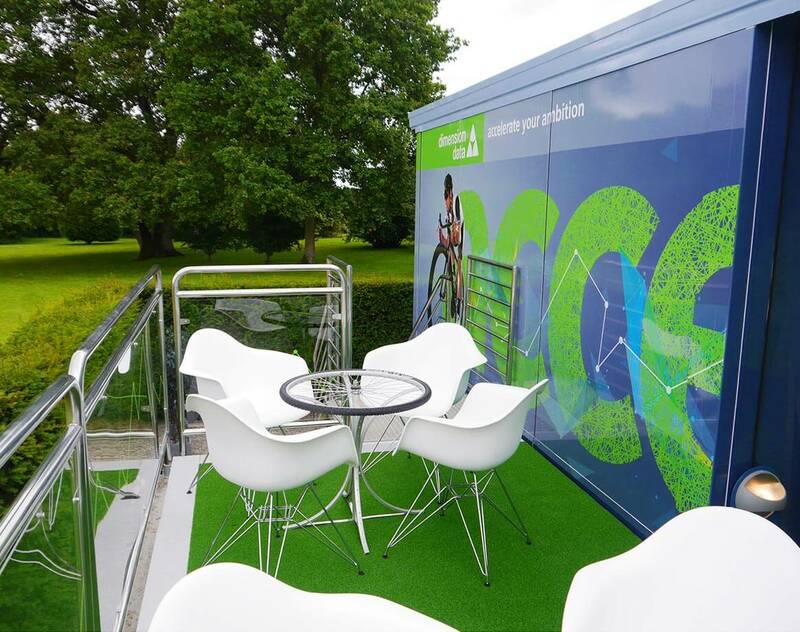 A giant full wall wrap creates a parallel between Dimension Data’s work on Smart Cities and the difference the Tour has made to rural areas of France, boasting another 5 augmented reality triggers to reinforce our message. 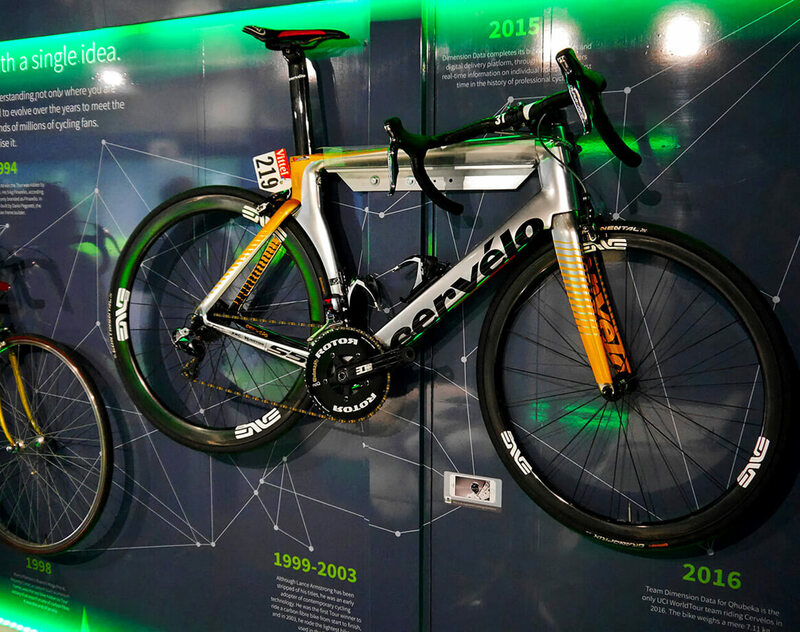 Here customers experience Dimension Data’s work with the Tour in real-time, with another 5 augmented reality triggers demonstrating the data’s journey from riders equipped with sensors to the cloud and on to the Big Data Truck. Customers are then given the opportunity to interact with the engineers working on the project via satellite feed. Visitors could experience how it worked for themselves by getting on a bike to measure their own performance against those competing in the Tour. One thing that struck me with JPC, is that you took the time to listen to the brief. 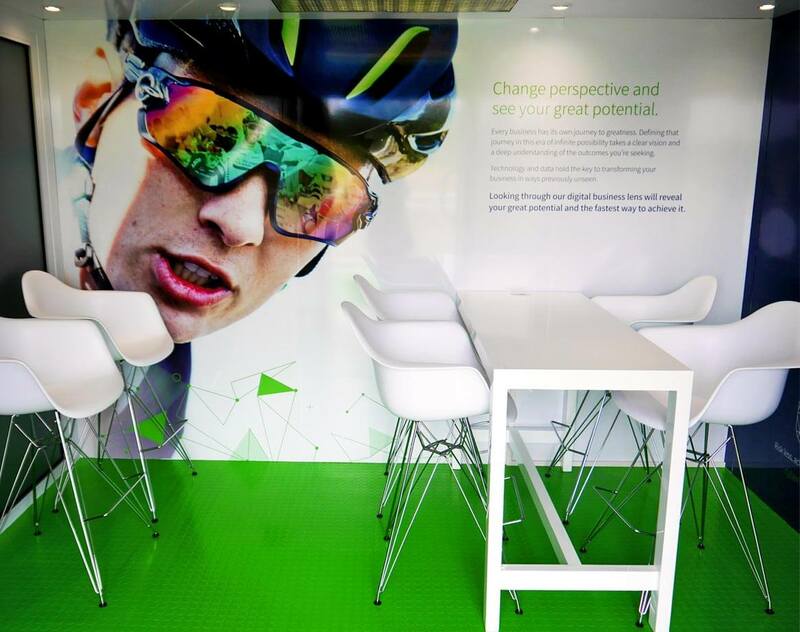 To understand who we are as Dimension Data, what we were trying to achieve and for our client, the Amaury Sports Organisation and the Tour de France and take that understanding into the experience centre.